America’s almighty hot dog is getting a delicious, wholesome makeover with the introduction of JENNIE-O® Uncured Turkey Breast Franks, one of 17 new on-trend turkey products unveiled today by Jennie-O. Other innovations that make it easy for Americans to eat well include flavored turkey bacon and taco-seasoned turkey sausage. “When it comes to meal time, Americans want it all: their favorite dishes, but with less fat, calories, artificial ingredients or preservatives. Fortunately, Jennie-O is in a unique position to meet the needs of today’s families and health-conscious consumers. Our uncured turkey franks are a great example of the flavorful, better-for-you foods we’re creating to satisfy and inspire grocery shoppers,” said Brent Koosmann, director of marketing, Jennie-O. Hot dogs are an American food icon, but a preference for premium meats and awareness of common preservatives have prompted many families to move away from this kid-friendly favorite. Nearly a third of purchasers are worried about the quality of the meat in hot dogs, and the hunt for more nutritious options may be what’s driving half of consumers to purchase more than one type of hot dog or sausage.1 Jennie-O’s new uncured turkey franks are giving Americans a reason to reach for this beloved and convenient protein product once again. JENNIE-O® Uncured Turkey Breast Franks are made with premium turkey breast and have 50 percent less fat than beef franks2. They include no artificial preservatives, colors or flavors, have no nitrites or nitrates added, and are gluten free. 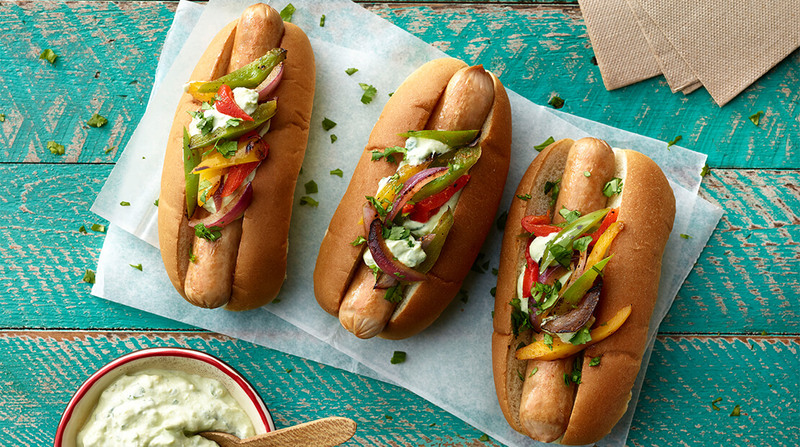 They’re delicious grilled as a classic Chicago-style hot dog, or tucked into a carb-cutting lettuce wrap topped with shredded veggies and guacamole. JENNIE-O® Uncured Turkey Franks are free of artificial preservatives, colors and flavors, have no nitrites or nitrates added, are gluten-free and have 40 percent less fat than beef franks2. Their savory taste goes beyond the bun when sliced into casseroles, quesadillas or grilled cheese sandwiches, for simple kid-friendly recipes. Jennie-O perfected the art of turkey bacon, making it possible to satisfy that crisp, flavorful craving with 60 percent less fat than regular bacon2. Consumer demand is growing for diverse and global flavors, with 66 percent of consumers eating a wider variety of ethnic cuisines now compared to five years ago.3 Jennie-O answers this call with the introduction of two new flavored turkey bacon varieties. JENNIE-O® Blueberry Turkey Bacon lets the taste buds have it both ways with a savory yet sweet combination. Made with real blueberries, it is ideal for breakfast recipes such as quiches, pancakes and tarts. In addition to having less fat, it is gluten free. JENNIE-O® Jalapeño Turkey Bacon is a hot new take on a traditional breakfast favorite. Made with real jalapeños, it is delicious on its own, or can be used to add some heat to appetizers, hot dog wraps and burgers. Other innovative new products that make it easy for Americans to eat well include JENNIE-O® Seasoned Turkey Sausage in Taco, Italian and Chorizo flavors; JENNIE-O® All Natural* Boneless Turkey Breast; and JENNIE-O® Turkey Burgers in Bacon and Cheddar, All Natural* White Turkey and All Natural* Seasoned varieties. Around the corner in the deli aisle, Jennie-O is innovating to fill the needs of consumers who want great-tasting, grab-and-go turkey options. New products include premium JENNIE-O® presliced turkey breast in several bold flavors including: Cajun, Smokey Chipotle and Sriracha. All are 98 percent fat-free and sold in vacuum-sealed packages with zipper closures for ease of use. Jennie-O’s new products are set to be in stores across the country starting this spring. More information is available at jennieo.com.